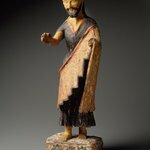 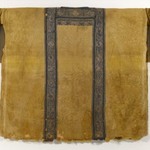 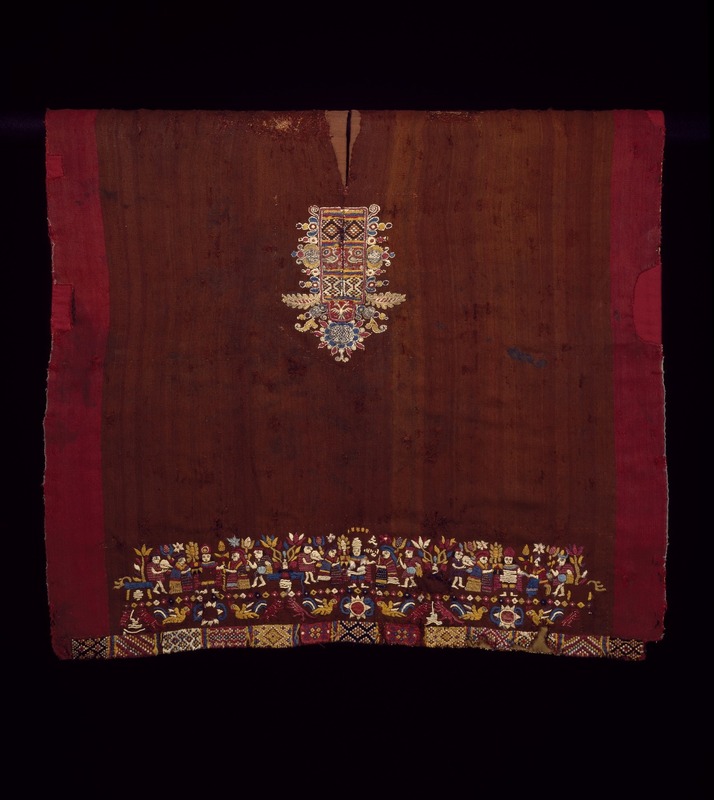 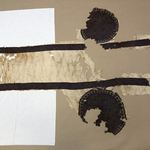 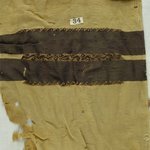 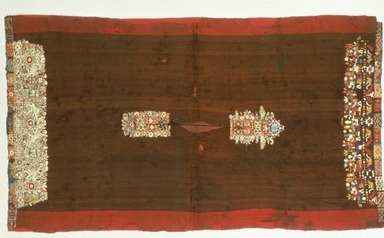 This uncu, or man’s tunic, features geometric bands adorned with both European-style shields and rampant lions, and traditional tocapu, individually patterned rectangles worn only by the highest native Andean elite. 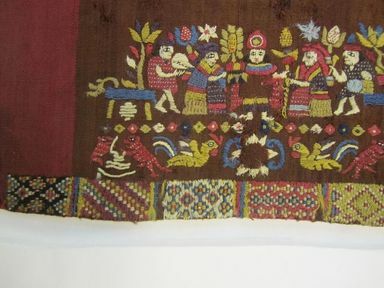 The incorporation of European imagery and materials in traditional Peruvian garments and accessories was a common strategy employed by indigenous Andean nobles to make their status legible to the Spanish. 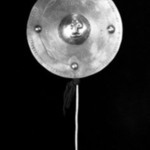 This device allowed them to claim the privileges accorded to them under the imperial system while preserving elements of their native cultural tradition. 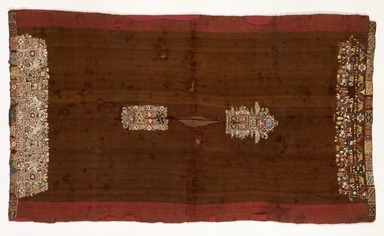 By the eighteenth century, Indian nobles were commissioning full-length, European-style Grand Manner portraits, in which they sometimes wore an uncu over a shirt of imported Flemish linen and lace, with their crown-bestowed coat of arms included nearby (see illustration). 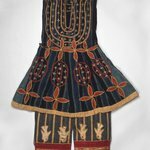 Este uncu, o túnica de hombre, muestra bandas geométricas adornadas tanto con escudos de estilo europeo y leones rampantes, como con tocapu tradicionales, diseños de rectángulos individuales utilizados sólo por nativos de la más alta élite andina. 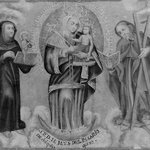 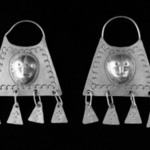 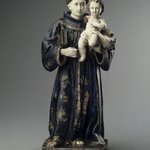 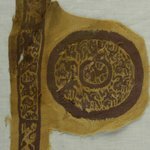 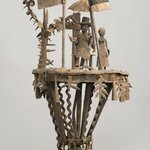 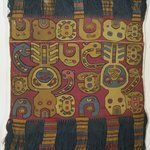 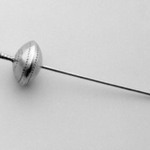 La incorporación de imaginería y materiales europeos en vestimentas y accesorios tradicionales peruanos era una estrategia común empleada por los indígenas andinos nobles para facilitar la legibilidad de su estatus por parte de los españoles. 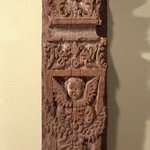 Este sistema les permitía revindicar los privilegios concedidos por el sistema imperial y preservar elementos de sus tradiciones culturales nativas. 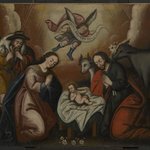 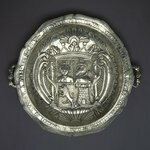 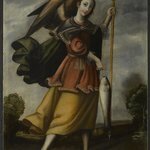 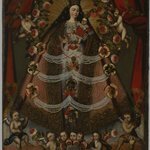 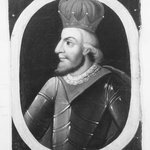 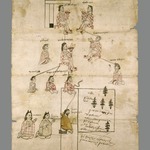 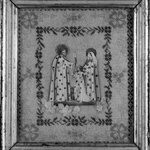 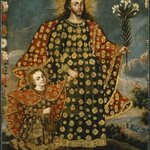 En el siglo XVIII, nobles indígenas solían comisionar retratos de cuerpo entero al estilo europeo conocido como Grand Manner, en los cuales a veces llevaban un uncu sobre una camisa de lino y encaje flamenco e incluían también su escudo de armas otorgado por la corona (ver ilustración). 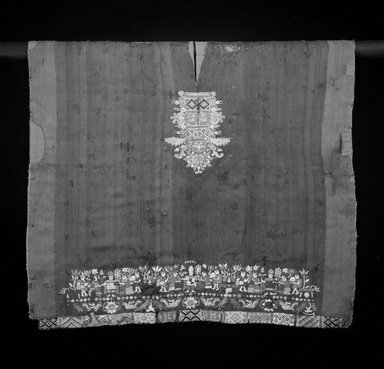 CATALOGUE DESCRIPTION Size: adult; probable wearer: male. 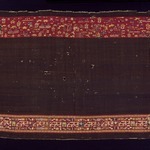 Wool (camelid), warp-faced plain weave; wool, silk, and metallic (on linen core) embroidery; wool plain-weave appliqué (European?). 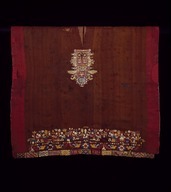 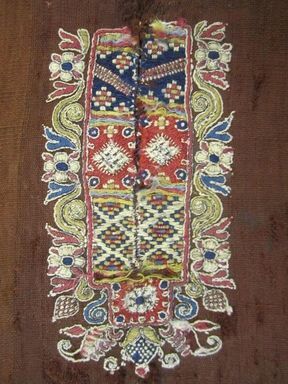 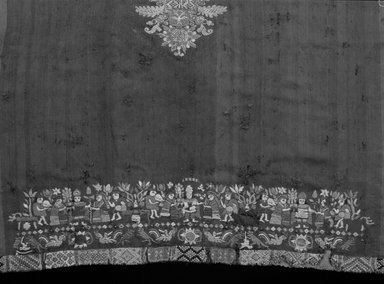 One of only a few known Spanish Colonial embroidered tunics composed of a single length of warp-faced plain weave camelid wool with a subtle herringbone pattern. 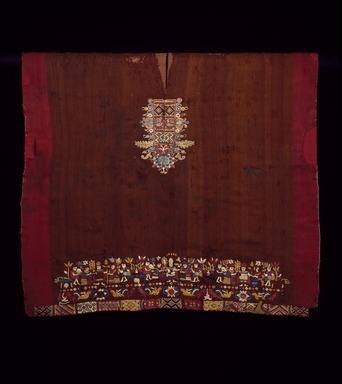 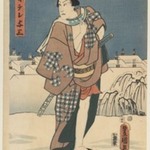 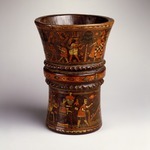 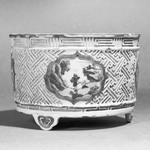 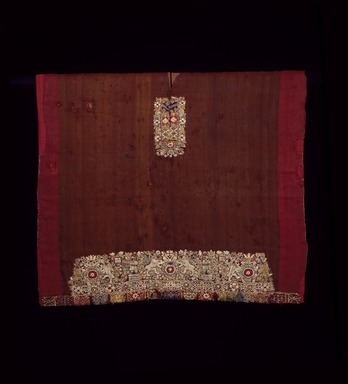 It is dark brown in color with broad stripes of red at the sides and embroidered designs at the neck opening and the bottom. 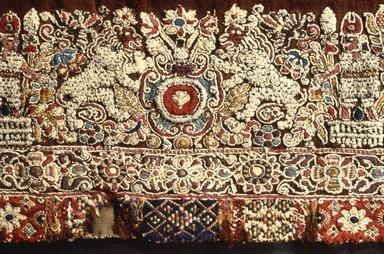 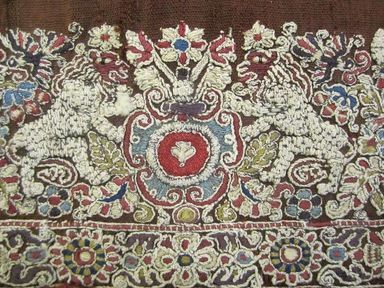 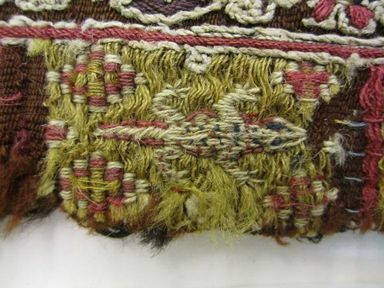 In several places the embroidery is covered by small appliqués of cloth. 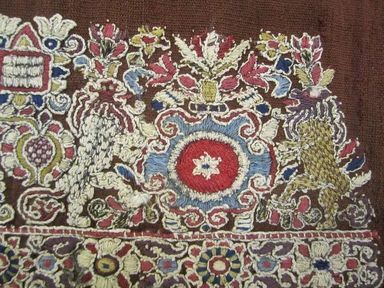 The warp threads alternate narrow stripes of yarns spun in the "S" direction with narrow stripes of yarns spun in the "Z" direction. 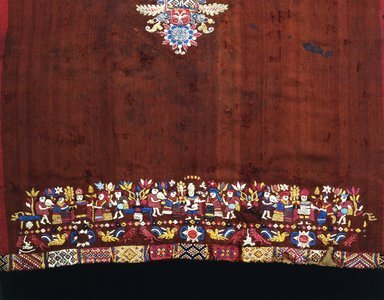 The result is a subtle striping effect throughout the fabric called l'loque. 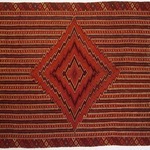 Contemporary Andean weavers believe l'loque keeps the "spirit" of the cloth contained. 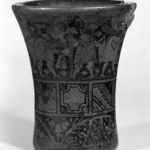 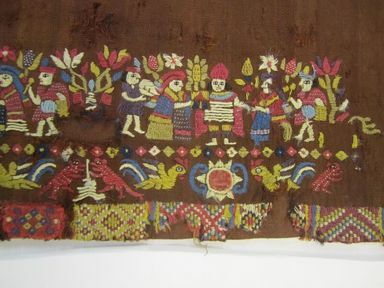 On one side, the border design consists of two Inca warriors amid three pairs of heraldic animals; on the other side three Incas are portrayed attended by musicians and women offering flowers. 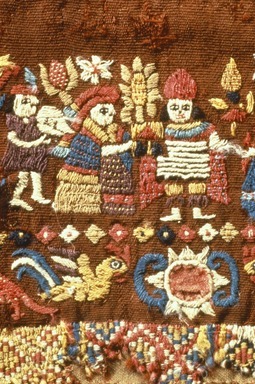 Embroidered above the head of the central Inca is a rainbow. 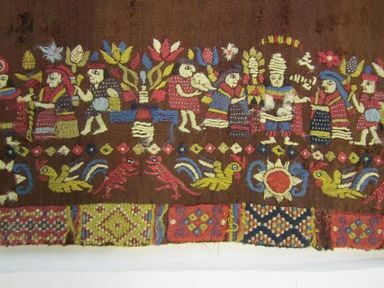 The heraldic animals and Inca warriors on the other side are sewn with silver threads in a dense composition that resembles European textile designs, while the Incas and their attendants are sewn in bright colors with each figure standing out clearly against the background in an arrangement similar to the painted designs on native drinking cups (keros). 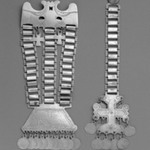 The bottom edges of both sides are the same. 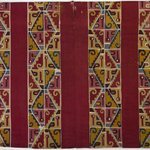 They are embroidered with a row of small rectangular patterns that recall the tocapu designs woven on pre-Conquest Inca tapestry tunics. 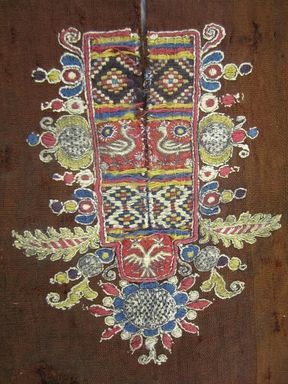 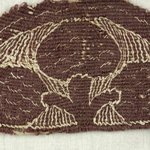 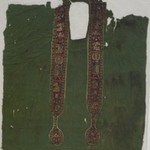 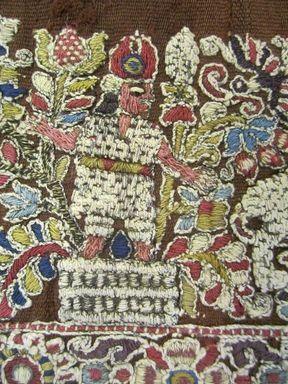 The neck of the tunic is also decorated with tocapu-like designs and floral motifs; on one side below the neck opening is an appliqué of a double-headed eagle of European derivation. 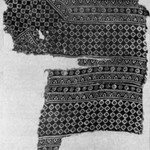 It is possible that some of the embroidery is a recent addition; however, the appearance of the garment convincingly indicates prolonged use.